Pictured are Citizens United For A Better Blanchard members talking during Thursday’s Putnam County Commissioners meeting about plans for flood mitigation on Blanchard River. Front row from left are are Jim Leopold, Dan Ellberbrock and Glenn Karhoff and back row from left, Joe Repienhoff and Jim Hoorman. 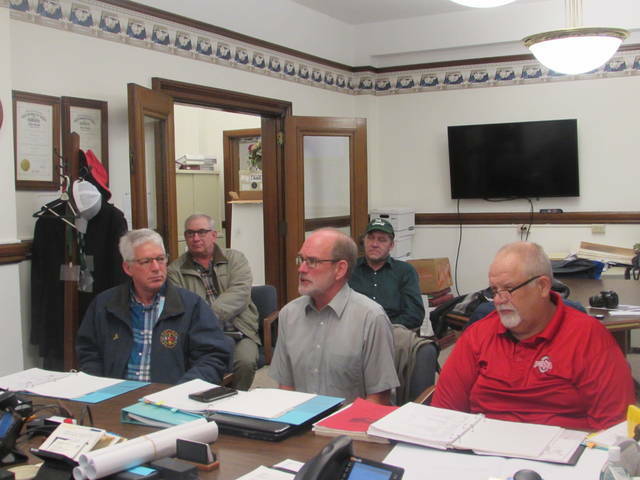 OTTAWA — Citizens United For A Better Blanchard members attended Thursday’s Putnam County Commissioners meeting to provide an update on a proposed flood mitigation plan for the Blanchard River. A flood warning was issued by the National Weather Service on the river at 10:30 p.m. Wednesday that extends until Sunday afternoon. The river is expected to crest at 7 p.m. today at 23.2 feet and the minor flood stage for the river is 23 feet, according to Kyle Brown, meteorologist with the National Weather Service. Citizens United For A Better Blanchard has had several meetings with local government officials and private groups to present a plan to address flooding of the river. There are four goals for the plan according to Leo Schroeder, retired certified crop adviser, that include delineating restrictive pinch points in the floodway of the river, establishing standards for retention and detention holding ponds, promoting and encouraging water control structures and promoting and using cover crops over the winter periods and early spring to absorb more rainfall. “I think we need to do something to alleviate the flooding because it will just get worse,” Schroeder said. Michael Lammers, commissioner, suggested having another public work session with township trustees, village mayors and area representatives that will be planned for the end of March. “My number one concern is when Findlay gets done with their flood mitigation how will that affect the Ottawa area in Putnam County,” Lammers said. If water gets through Findlay at a quicker rate there could be a chance of it getting to Putnam County quicker, he said. In other business, the commissioners heard an update on Putnam County Courthouse renovations from Tim Schnipke, Putnam County maintenance superintendent, and Kevin Niese, Technicon Design Group project manager. They presented artist drawings to the commissioners of what the improvements will look like when completed. “For all of the renovations we are trying to get cost estimates and will report back to the commissioners then,” Schnipke said. The commission previously approved its 2019 budget that includes $2.5 million in the capital improvements budget that will be used for courthouse renovations. The first project is to replace a leaking courthouse roof that is over 100 years old. Another project is to replace the courthouse’s drainage system and masonry issues with plans to put the project out for bid this spring and get it completed by next fall. A decision following Supreme Court assessment of the county’s security system in 2007 recommended the county go down to one entrance at the courthouse. In order to facilitate that recommendation the current handicapped access that is at the north side of the courthouse building will be changed to the east side of the building. “This entrance will improve courthouse safety. The concrete on the existing handicapped ramp is deteriorating and needs replaced,” Niese said. Another project will be to remodel the courthouse elevator. The last time that was completed was in the 1960s. A new elevator car will be built and there will be new hydraulics installed on the elevator for safety purposes and part availability.